sycamore stirrings: Get your SCRAPDOWN! Ready for some fun? I am! 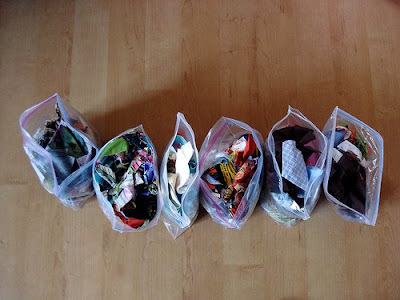 I'm also ready to free myself from my many, many bags of fabric scraps. It's a joke that I've held onto these for so long. I even moved them to Europe. It's ridiculous. I tried to throw them away, just to move on, lighten the load. I ended up taking them out of the garbage and putting them in the pile of things to be moved to Lux. It's a sickness, really. So here I am scraps and all. Here's the plan: Each month or so we'll decide on an item(s) to make that we'll each create out of our scraps. A quilt? Pillow? Bag? We can share our process and projects in a flickr group (and our blogs - if you have one.) Jump in for one project or do them all! I think it's going to be really fun. We may even get all our Christmas presents made along the way. I'll announce the first project tomorrow! It'll be a super fun one, trust me. So, go look through your stash. Go uncover all the bits and pieces you just couldn't part with. Now is the time. I hope you'll join me. Here's to letting go of our baggage! This sounds like oodles of fun. 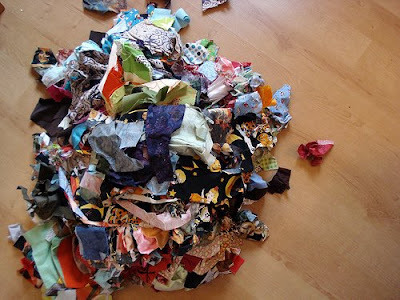 I have so many scraps of favorite fabrics that I cannot bear to part with! I can't wait for the project!!! I love a good idea! YAAAAYYY!!! So fun! Can't wait! So fun, I am IN! Easy Peasy Projects right? 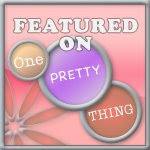 I can't do much more then that without you (my personal sewing/life coach) here to help me. I love the idea. I made a draft snake from scraps last night. The hardest part was deciding which scraps to use. I'd love some more ideas for all those tiny pieces. And if you're looking for ideas, the draft snake from Lotta Jansdotter (Simple Sewing: Patterns and How-To for 24 Fresh and Easy Projects) is a sinch. Fun idea! I have some scraps I am needing to do something with...can't wait to see what the project is! I love this idea! I save most of my scraps because I can't stand the thought of throwing away something perfectly useful. Sounds like fun! I was just wondering what I should do with all of my scraps. Thanks! I'm a friend of Jawan's and I'm looking forward to your projects. I'm going to get my girls involved in this project! I need to do something with beads - I made jewelry so many years ago and I can't let go of the beads! !